The pontoons are designed for coastal sheltered marina environments. 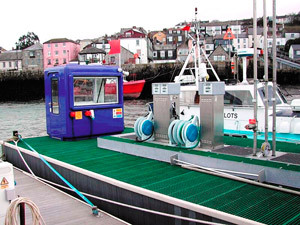 Each pontoon is designed to provide a self contained floating facility for the storage and dispensing of Petrol and Diesel fuel for coastal sheltered marina environments. The structure is configured to provide buoyancy and to protect the fuel tank from damage. 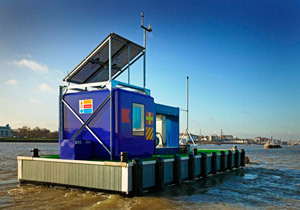 The unique design provides a safe, robust, stable and economic means of storing and dispensing fuel. Fending; Full-length perimeter white rubber fender around the pontoon at deck level. All steelwork is to BS 4360 grade 43a. Framework is all hot dip galvanized. All components of the buoyancy structure air tested to 2 psig and all welded joints soap and water tested. Pumps and Hose Reels, mounted on spillage containment area. Fill pipes incorporating overfill prevention valves, vent pipes and suction pipes to each pump. Kiosk constructed from GRP with smooth semi-gloss external surface. Statutory fire fighting equipment and signage. Mains electrical switchgear and cables to each pump, protected spurs for monitoring systems, kiosk lights and auxiliary sockets, and connection point for incoming mains supply. 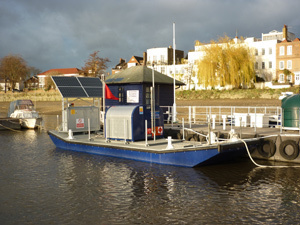 The Pontoon will be commissioned and presented for UK Petroleum Officer and Trading Standards Approval.